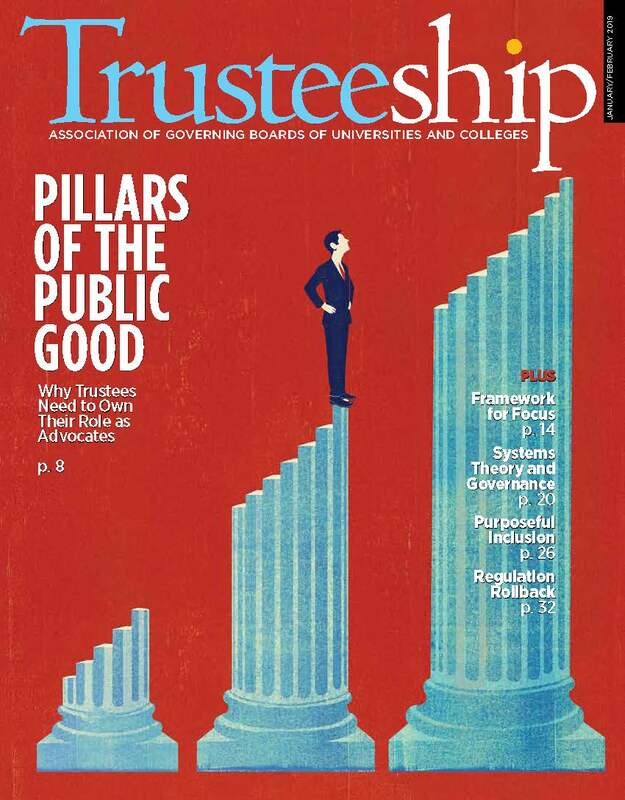 Trusteeship welcomes 2019 with a piece by Genevieve G. Shaker and William M. Plater on Pillars of the Public Good, in which they address how trustees can think more deliberately about their commitment to the public good and provide 12 steps for boards. Kevin P. Kearns follows up with A Framework for Focus, providing governing boards with a dashboard that can help them embrace their many roles—and assess their strengths and weaknesses. An Educational Relationship by Joseph G. Burke, A. Paul Bradley Jr., and William Donaldson is an examination on how systems theory (typically associated with business management) can be applied to governance and can strengthen board focus, roles and responsibilities. Jennifer Jefferson in Purposeful Inclusion asks how boards can think differently about the qualities they want in a leader and attract more women candidates to these positions. Finally, Terry Hartle closes the first issue of the new year with The Rollback—a look at changes in federal regulation of higher education, the impact on institutions, and what’s on the horizon. Happy reading—and happy new year from the Trusteeship staff! How Can Institutions Use Stress Testing to Ensure Their Fiscal Health?